This unique first-person account offers a window into the mind of a high-functioning, 27-year-old British autistic savant with Asperger's syndrome. Tammet's ability to think abstractly, deviate from routine, and empathize, interact and communicate with others is impaired, yet he's capable of incredible feats of memorization and mental calculation. Besides being able to effortlessly multiply and divide huge sums in his head with the speed and accuracy of a computer, Tammet, the subject of the 2005 documentary Brainman, learned Icelandic in a single week and recited the number pi up to the 22,514th digit, breaking the European record. He also experiences synesthesia, an unusual neurological syndrome that enables him to experience numbers and words as "shapes, colors, textures and motions." Tammet traces his life from a frustrating, withdrawn childhood and adolescence to his adult achievements, which include teaching in Lithuania, achieving financial independence with an educational Web site and sustaining a long-term romantic relationship. As one of only about 50 people living today with synesthesia and autism, Tammet's condition is intriguing to researchers; his ability to express himself clearly and with a surprisingly engaging tone (given his symptoms) makes for an account that will intrigue others as well. I do not usually read much non-fiction, and when I do, it is usually historical in nature. This book certainly deviates from the norm for me- but I think that's good. To be perfectly honest, I picked it up because I thought it would be a quick read. And it is- I read it in two sittings, I think. The sittings were just separated by a couple of weeks. I really enjoyed most of this book- it is really fascinating to read about the way an autistic savant experiences the world. I think Tammet does an amazing job of describing things that are completely foreign concepts to most people. For example, every number in existence has a specific shape and feel for him. Every number. And he visualizes each one, and can even draw pictures of them. It's so completely foreign to the way that I experience numbers that I can't even imagine what it must be like in the man's head. But clearly, his head is a very interesting place to be. The book does sometimes get bogged down with descriptions of numbers or languages, though as those are two things that Tammet has true passion for, it's understandable. I admit to skimming paragraphs in which grammatical context of several languages was described, or in which Tammet waxed lyrical about prime numbers. 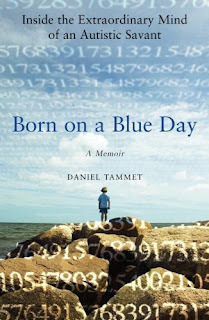 But Tammet has led a very interesting life- especially in the past few years- and he is really doing amazing things to help the world learn more about Asperger's and autism. His book is very well-written for someone who claims he has trouble communicating with people, and I feel like I now have a better understanding of autism. More importantly, I think it really hit me in reading the book just how differently people can experience the world around us. I feel like I usually expect other people to generally see things around them in the same way that I do- this book makes it very clear that this isn't the case. I doubt that anyone else sees the environment around him in the way I do, and it was really kind of amazing to have this made so clear to me in this book. Obviously, we all have a general knowledge of that fact that everyone is unique and it takes all kinds to make the world work- but even in the way people approach numbers or read books or learn a language- it's amazing just how varied the experience can be, and the ways in which your mind can go about resolving a situation. It was a thought-provoking read, definitely, and I am glad I picked it from my shelf. Hey you. I never talk to you anymore, so I thought a random comment was in order! I have read this book, though, it was pretty good, huh? Anyway, get in touch and tell me what's new! I miss hearing from you! It sounds pretty fascinating, Aarti. I'll have to pick it up. I love the way he views numbers. It's one thing to know we're "all unique little snowflakes" in the abstract but it's really brought home to us occasionally in more concrete terms. This isn't a backhanded compliment, but I really can't believe what an insightful writer you are! I think it's all the reading....I honestly was moved by your comments about not fully understanding the loss of loved ones until you return to where they have always been. It meant a lot.